Irish cap is an embroidered design that is ideal to wear when your are drinking as it features a built-in bottle opener on the brim. 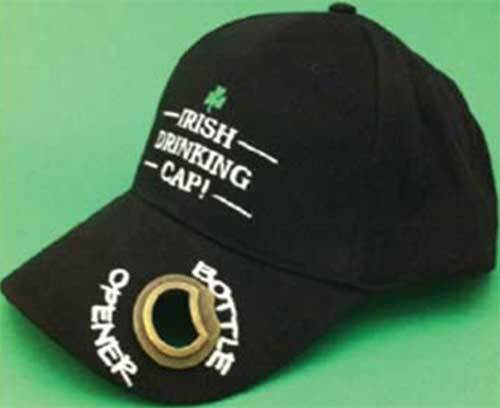 This Irish drinking cap features a built-in metal bottle opener along with an embroidered green shamrock. The 100% cotton black shamrock cap features an adjustable Velcro strap and is one size fits most. The Irish cap is made in Ireland by Liffey Artefacts and it includes a shamrock history card, complements of The Irish Gift House. Póg Mo Thóin Irish cap features a built-in bottle opener on the brim and it is enhanced with a leprechaun and shamrock. Irish cap is a baseball style design that features a tricolor Irish flag shield along with a shamrock. Irish cap is a relaxed design that features classic baseball style lettering. Irish cap features an embroidered Ireland along with a shamrock in the design. Irish cap features a Celtic Trinity knot on the brim along with a shamrock accented Ireland on the front. Irish cap is enhanced with a Celtic Trinity knot along with the word Ireland.